The Greater Port Washington Business Improvement District’s (BID) New Tenant Bonus Program recently awarded Port Salt Cave which is located at 403 Main Street (Inspiration Wharf) $2,000. “The BID Grant will be used for our sign and to improve the curb appeal of our location” stated Sue A. Sullivan, Owner, Port Salt Cave. “The purpose of the New Tenant Bonus Program is to allow our organization to help start a business within the BID District. 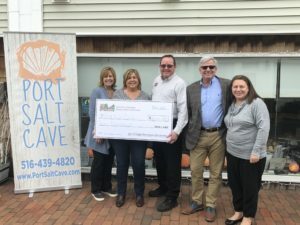 We are excited that Port Salt Cave has chosen Port Washington and we wish them much success” stated Mariann Dalimonte, Executive Director, BID. To find out more about the Greater Port Washington Business Improvement District’s new Tenant Bonus Program, please contact us via e-mail at gpwbid@optonline.net or visit our website at www.portwashingtonbid.org for a listing of rules and specifications. Lori Ciotoli, Port Salt Cave, Sue A. Sullivan, Owner, Port Salt Cave. Paul Oleksiw, President, BID, Bob Weitzner, Mayor of Port North and Board Member of BID, and Mariann Dalimonte, Executive Director, BID.